Even without the box set memorabilia, Gone With The Wind would be worth purchasing alone but the added features are a nice touch. Based on the novel by Margaret Mitchell, "Gone With The Wind" tells the story of Scarlet O'Hara (Vivien Leigh; Waterloo Bridge, Anna Karenina), a spoiled southern belle who struggles to keep her planation home, "Tara", during the Civil war while she pines for an unrequited love, Ashley Wilkes (Leslie Howard; The Scarlet Pimpernel). Eventually she falls for a Barricade runner, Rhett Butler (Clark Gable; Mutiny on the Bounty, The Call of the Wild) which leads to a tumultuous relationship. As she watches her beloved Atlanta burn down and rebuild, Scarlet too must pick up the piece of her life and move on after the war. Hailed as one of the American cinema's grandest and spectacular films it was directed by the ambitious Victor Fleming (The Wizard of OZ) and captured 10 Academy Awards including Best Picture, Best actress and a groundbreaking win for Hattie McDaniel as best supporting actress. The novel has been translated in 16 languages and stills sells up to 50,000 copies per year. The Ultimate Collector's Edition memorabilia includes a replica of Rhett Butler's handkerchief and a music box paperweight that plays Tara's theme and bears an image of the Rhett-Scarlett kiss. Also included is a 36-page companion booklet featuring a look at the immortal style of Gone with the Wind, written by New York fashion designer and Project Runway finalist Austin Scarlett, whose signature look reflects the romantic elegance of the Gone with the Wind era. With beautiful photographs of the magnificent wardrobe from the movie, the book is a special keepsake. The new special features include footage of Clark Gable and Vivien Leigh attending the original movie premiere in Atlanta and "Old South/New South," a journey through today's South, revisiting the real-life locations depicted to see how the world of the Old South continues to inform life in the New South's cosmopolitan world. Other segments include the previously released documentary "The Making of a legend: Gone With The Wind" and hour-long segments about both the leading actor and actress which chronicles their lives and careers. Overall there are more than 8 hours of extra a true fan of the movie would enjoy. The 1080p high definition video plays with such sharpness and clarity, it could almost rival today's feature films and the Dolby TrueHD 5.1 Audio allows the audience to enjoy the orchestration of one of the most memorable movie soundtracks every recorded. 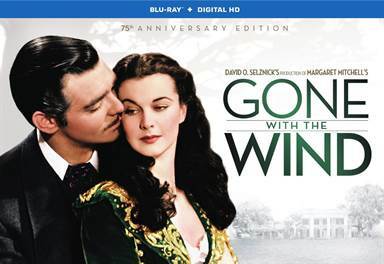 Download Gone With the Wind 75th Anniversary from the iTunes Store in Digial HD. For more information about Gone With The Wind visit the FlickDirect Movie Database.